Update (August 15, 2016): Add link to part 2 of the tutorial and add the flash view file. Update (August 08, 2016): User needs to be logged in to create a ticket Update (August 08, 2016): Corrected some errors pointed out on the comments. Update (August 06, 2016): Add Use App\CategoryLaravel is currently the most starred PHP framework on GitHub and also the most popular PHP framework. Thanks to Taylor Otwell and the Laravel community, many companies and people are building awesome applications with this framework. In this two part tutorial, I&apos;ll show you how to build a robust application using the Laravel framework. We&apos;re going to be building a support ticket application. 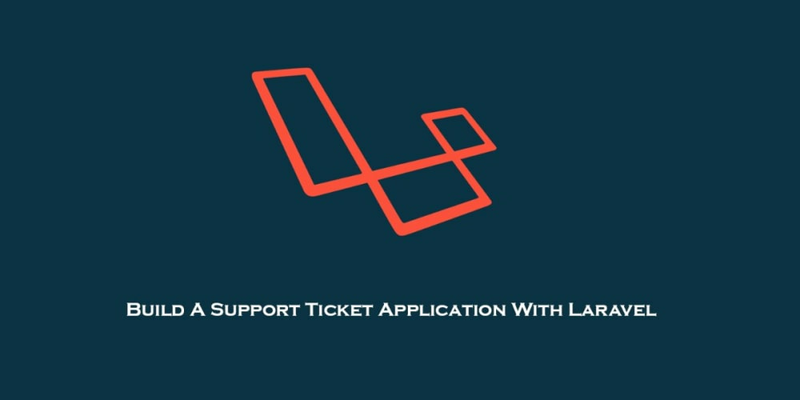 A support ticket application provides a medium for customers to lodge issues they face using a particular organization&apos;s service/product by opening a support ticket which the organization&apos;s help desk. What we will be building will be minimal, but it will have the major features of support ticket application. Once a ticket is marked as closed, the user who opened the ticket will be notified by email on the status of the ticket. Below is an image of the final output of what we will be building. First let&apos;s install Laravel, we will be using the latest version of Laravel which is 5.2.39 at the time of this tutorial. I&apos;ll make use of the Laravel installer, but you can use your preferred method. You should see the default Laravel welcome page with the text Laravel 5. The rest of this tutorial assumes you are already in the project directory which is support-ticket. This will create all of the routes and views you need for authentication. Now there is a register and login page with which to authenticate the users. Now we need a database to hold our data. Open the .env file and fill it with your database details. Next we need a users table. When you install Laravel, it will create for you a User model and some migration files to create the users and password resets tables respectively. But before we run the migrations, let&apos;s modify the users migration file a bit to suit our application. Now users can register and login to the application. Only registered users can make use of our Support Ticket Application . Having said that, register as a new user and login to create a ticket. Having taken care of users authentication, we move on to allow users create new tickets. First we need a tickets table to hold the tickets that users will be creating and also a model for them. The migration file is pretty straightforward, we have a user_id column that will hold the id of the user that created the ticket, a category_id column to indicate the category the ticket belongs, ticket_id column which hold a unique random string that will be used to refer to the ticket, a title column, a priority column, a message column and a status column which indicate whether a ticket is open or closed. This tells Laravel that the columns specified can be mass assigned. We also need to do this with our Category model. Let&apos;s set the relationship between the Ticket model and the Category model. A ticket can belong to a category, while a category can have many tickets. This is a one to many relationship and we will use Eloquent to setup the relationship. For now we need to manually populate the categories table with some data. I&apos;ll be using Laravel artisan&apos;s tinker. This will create a Technical category inside the categories table. You can repeat the process above to add more categories. Next we need a controller that will contain the logic for opening a ticket. The TicketsController now has a create() function which will get all the categories created and pass them along to a view file. Before we move further, lets create the routes that will handle opening a new ticket. The first route /new_ticket will show the form to open a new ticket while the second route will call the store() on TicketsController which will do the actual storing of the ticket in the database. The create() from above return a view file tickets.create which we have yet to create. Let&apos;s go on and create the file. To handle the actual saving of the ticket to the database, open TicketsController and add the store() to it. The store() accepts two arguments, $request variable of type Request and $mailer variable of type AppMailer which we have yet to create. The method first sets some form validations rules that must be met before moving forward. Upon successful form validation, a new the ticket is created and an email containing the ticket details is sent to the user (more on this below) and finally the user is redirected back with a success message. You can see the sendTicketInformation() that store() from above called. It basically just prepares the email to be sent to the user that opened the ticket. The deliver() function does the actual sending of the email. This is the email that will be sent to the user once a ticket is created. Now hit the browser and try opening a new ticket, you should see the mail content logged in the laravel.log file once the ticket is created. So far, we have been able to setup our application and created our first ticket. In the next post I will cover commenting on ticket and marking ticket as closed. If you have any questions about the tutorial, let me know in the comments below. And be sure to check out part two here.